Coastal Point • Submitted Laura Pusey of Seaford was named CHEER’s Direct Care Worker of the Quarter for Summer 2018. Pictured, from left, are: CHEER CEO Ken Bock, Laura Pusey, CHEER Chief Administrative Officer Joyce Westen and CHEER Chief Operating Officer Beckett Wheatley. CHEER Inc. honored direct care workers (DCWs) in its Personal Assistance Services Agency (PASA) at a recent holiday meal and awards ceremony. The evening also recognized the hard work of the aides to accomplish just under 100,000 service hours to senior citizens in Sussex County during 2018. Receiving the Direct Care Worker of the Quarter award for Summer 2018 was Laura Pusey of Seaford, who has been with CHEER for 22 years. Clients, CHEER representatives said, refer to her as very kind and quiet, and having a wonderful personality. The Direct Care Worker of the Fall 2018 Quarter award went to Phyllis Collick of Milton. Servicing CHEER customers for 20 years, Collick received accolades from the daughter of one of her clients. Paulette Jones of Seaford was recognized for working the most service hours by a full-time Direct Care Worker. She has been with CHEER for 15 years and, during the past fiscal year, she provided 2,408.5 hours to CHEER seniors. Receiving the Most Service Hours award for a part-time direct care worker was Colby Murray of Georgetown. Employed by CHEER for almost two years, Murray has juggled school time and work time to provide 1,527.25 hours to CHEER seniors. 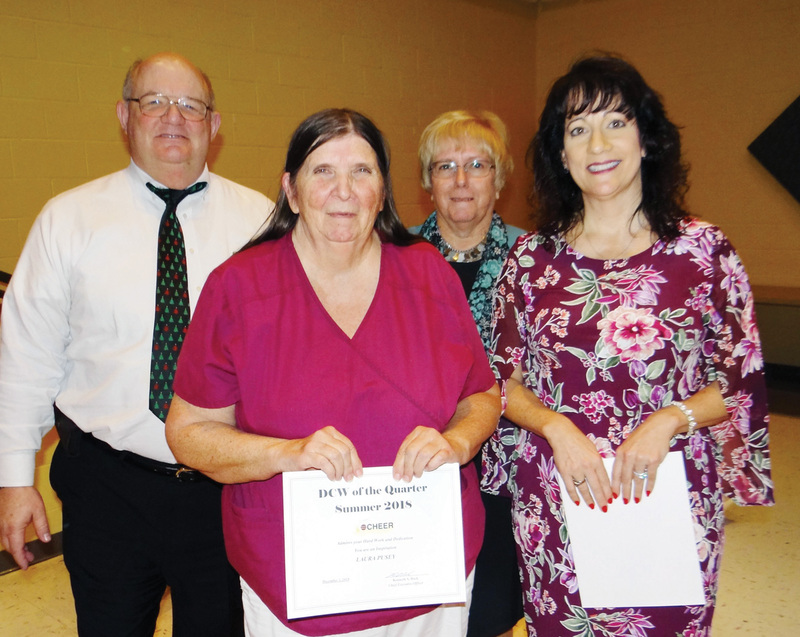 Five-year milestone employment recognition went to: 25 years — Karla Oney (Seaford); 20 years — Phyllis Collick (Milton); five years — Heather Beutler (Lincoln), Vickie Chandler (Millsboro), Louella Curtis (Laurel), Lashonda Stanley (Bridgeville) and Mary Lou Ewell (Georgetown). A number of direct care workers were recognized for referring customers to CHEER’s program. Karla Oney of Seaford recognized that an elderly gentleman was in need of help and assisted him in getting service. Kelsey Smith of Harrington started a casual chat with a person in the drug store about CHEER services, and now CHEER cares for their loved one five days a week. Also, Brenda Schafer of Millsboro referred a lady to CHEER who is now receiving 35 hours of service a week. CHEER also expressed its sadness in losing one of its valued direct care workers with the announcement that, after 21 years of service, Alice Fitchett of Seaford would be retiring at the end of 2018. She was thanked for her commitment and will be truly missed, they said. At the end of the ceremony, CHEER Chief Executive Officer Ken Bock announced a new recognition for direct care workers. Beginning in January 2019, a Star of the Month will be awarded to a DCW chosen by a predetermined set of criteria. The award will bring with it not only recognition for their hard work but also gifts of appreciation from the agency. The CHEER Personal Assistance Services Agency is staffed by trained, bonded and insured professionals who provide care and companionship for seniors in Sussex County. Anyone interested in being part of this team can call (302) 515-3044 for more information on employment opportunities. Anyone needing services for their senior loved one can call (302) 854-9555 for more information.